Woodman Machine Products undertakes tool and die work for many clients and a wide range of purposes. 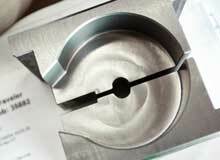 > Cutting tools with custom profiles and hardening are produced both on an individual basis and in batches. Please contact us by telephone, fax, or e-mail: we will be happy to meet with you to discuss your needs.